Contributed by: Thulsa ( ). 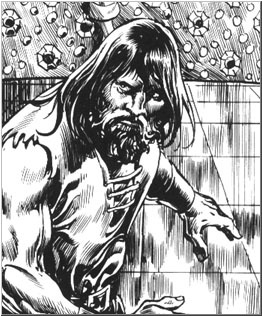 The stat block is based on Vincent N. Darlage's version of Taurus at the Conan d20 page (see the links page), with some slight modifications. "Taurus, called a prince of thieves, was tall as the Cimmerian, and heavier; he was big-bellied and fat, but his every movement betokened a subtle dynamic magnetism, which was reflected in the keen eyes that glinted vitally, even in the starlight. He was barefooted and carried a coil of what looked like a thin, strong rope, knotted at regular intervals." -- Robert E. Howard: "The Tower of the Elephant"
Physical Appearance: Tall and muscular (although with a big belly), but with lightning reflexes. Taurus has shoulder-length black hair and a wild, ungroomed beard. Background: Although Taurus is a Nemedian, his skills rival those of the Zamoran master-thieves. He has traveled far in the Hyborian world and (somewhat exaggerated) tales of his escapades can be heard in the drinking-dens of major cities such as Belverus, Messantia, Asgalun and Shadizar. Taurus will always carefully plan his thievery. He sometimes accepts missions to retrieve precious items for people who pay the right price -- with few questions asked. Role-Playing Notes: As befits a Prince of Thieves, Taurus often swears by Bel, the Shemitish god of thievery. Equipment: One dose of black lotus powder (equivalent to dust of sneezing and choking) stolen from a caravan bound for Stygia, 150 ft. of rope made from dead women's hair, thieves' tools. Notes: Taurus strikes from the shadows, usually with strange and esoteric weapons. Otherwise, he strangles his victims.